Hallux Valgus supporter 《SAKAMOTO-HVR》 - Bunion / Hallux Valgus - Product - The Industrial Promoting Co. Ltd.
Because people today wear socks or stockings, their toes do not all flatten out, so the force underfoot is not equal. 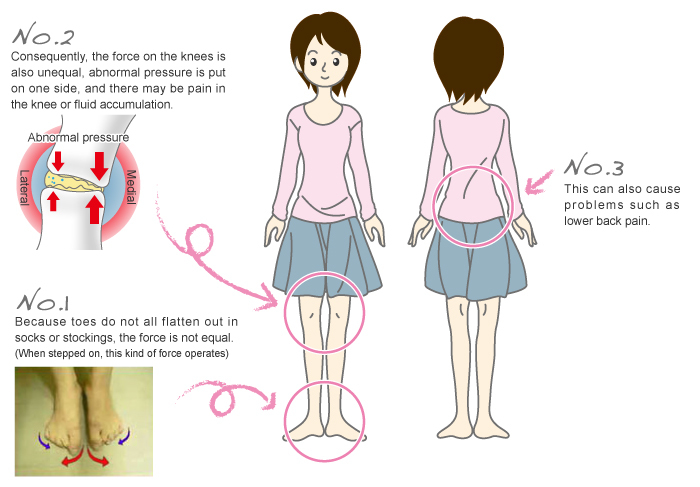 Consequently, the force on the knees is also unequal, abnormal pressure is put on one side, there may be pain in the knee or fluid accumulation, and this is a cause of lower back pain. 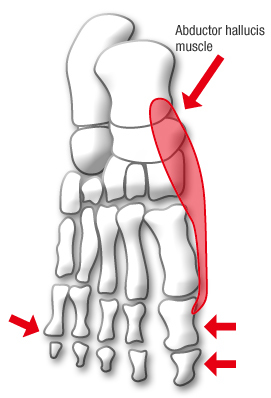 The hallux valgus supporter Bochikun encloses the abductor hallucis muscle extending from the big toe and the abductor digiti minimi muscle extending from the little toe in the supporter itself, applies pressure from either side, stimulates both abductor muscles, and, in particular, makes it easier to return medially a big toe that has twisted laterally. One cause of digitus valgus and hallux valgus is thought to be changes in the abductor hallucis muscle brought about by the application of external force. The external force placed on the big toe and little toe causes the toes to turn medially and places a burden on the abductor hallucis muscle, and the ligaments are stretched and tired, resulting in insufficient strength to return the toes to their original position. Toes are important for actions using the foot. If they are not functioning properly, a burden is incurred when walking or running. Since these activities are invariably performed on a daily basis, we believe this to be a cause of gradual buildup of burden and digitus valgus or hallux valgus. Bochikun does not hurt since it can be freely adjusted depending on the deformity of the big toe and the size of the foot. We have used the high-grade material for the fabric material. We have achieved a thickness of just 0.5 mm using high-grade material woven in special textile factories just for Bochikun with the emphasis on comfort of fit. The material stretches lengthwise and crosswise for a perfect fit and is comfortable even in summer or when sleeping. While using Bochikun, you can wear whichever shoes you like. Because it does not interfere with movement, it is also very popular with athletes. Bochikun is a patented, Japanese-made supporter. It has also been used by doctors in orthopedic hospitals and clinics and has been very well received. When both abductor muscles are extended, shoes and socks put pressure on the tips of the toes for a long period, the strength of the muscles is weakened, and toes do not return to the normal position. The supporter itself encloses the abductor hallucis muscle and the abductor digiti minimi muscle, applies pressure from either side, stimulates both abductor muscles, and, in particular, makes it easier to return medially a big toe that has twisted laterally. By pulling the big toe “medially,” the supporter has been designed to also return the other four toes to the straight position and ease the burden on joints in the lower body. Since it can be freely adjusted depending on the deformity of the big toe and the size and the condition of the foot, continuous use will accustom you to a well-balanced walking gait that places little burden on the knees and lower back.